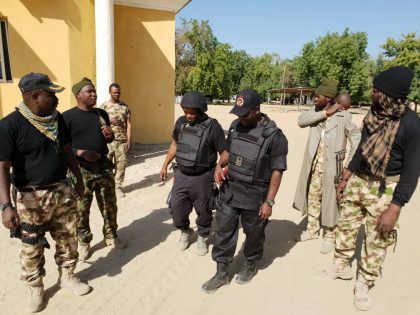 Onyema Nwachukwu, Maiduguri: Theatre Commander Operation LAFIYA DOLE, Major General Benson Akinroluyo has urged troops of Operation LAFIYA DOLE conducting clearance operations in Baga town and adjoining villages to sustain the fighting spirit with which they have defeated Boko Haram terrorists in Baga and other surrounding villages. General Akinroluyo gave the charge today, during an operational visit to Baga, where he conveyed the special commendation of the Chief of Army Staff (COAS) Lieutenant General Tukur Yusuf Buratai to gallant troops who had in a recent clearance operation dislodged elements of Boko Haram terrorists from Baga, as well as other surrounding villages thereby fully regaining control of the locations. Addressing the troops, who were evidently in high spirit, General Akinroluyo accompanied by the Commander, Nigerian Army Special Forces Command, Major General Moundhey Ali, told the troops that the COAS was particularly pleased with their recent victory over the insurgents and the operational successes in the general area of Baga and the adjoining villages. He urged them to be relentless and decisive in combating the insurgents, adding, that no inch of Nigeria’s territory should be occupied by the terrorists. He also enjoined the troops to sustain the tempo of the operation and maintain a high morale to enable them consolidate on the successes so far made in the clearance Operations. General Akinroluyo further gave the troops assurance that their welfare is paramount to the Chief of Army Staff and pointed out, that their wellbeing is a priority, that cannot be misplaced by the current leadership. He noted, that troops who were wounded during the operation are currently receiving adequate treatment and are fast recuperating. The Theatre Commander and other members of the visiting team, later inspected the troops’ equipment at their various deployments.